Former professional footballer Alex Donald travelled from his Ballymena home to combine a family visit to his native Kirkliston with a search for gold last week. And he found it at the Scottish Masters Athletics Championships at Grangemouth Stadium. 70-year-old super fit Alex claimed a gold medal in the 400 metres event in his age category. Not only that but he also came close to adding another two in the 100m and 200m events, before having to but had to settle for silver instead. He commented, “I was delighted with my success but slightly disappointed I did not win three golds. Although football was the sport in which he made his name playing for Port Vale in England, Derry City and Ballymena United in Northern Ireland, he first shone on the running track. He won the West Lothian County Schools sprint title while at Kirkliston Primary School and then Winchburgh Secondary. But his fleetness of foot transferred itself to the football pitch and he soon became a sought after player at Winchburgh Albion and Pumpherston Juniors. And his displays with Pumpherston attracted the attention, and prompted a meeting, of the sport’s genuine all-time legends, the iconic Sir Stanley Matthews. The Wizard of Dribble - the first ever winner of the now Messi/Ronaldo dominated Ballon d’Or - was then Port Vale’s manager and arrived in person at Alex’s family home in the village’s Marshall Road to persuade his parents that their 17-year-old son should sign. Sir Stanley presented Mrs Donald with gifts of porcelain and pottery bearing his embossed signature and invited Mr and Mrs Donald out for a meal in Edinburgh. 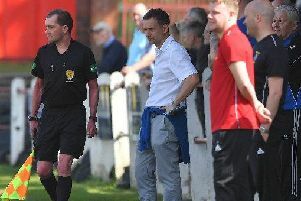 After three successful seasons with Vale, Alex enjoyed a three year stint with Derry City before going part time with Ballymena United while combining playing with a job as manager of Michelin’s factory there. He played many years for United, becoming a local hero with his service rewarded with a testimonial game against then FA Cup holders Southampton. The match featured many top names including George Best and Mick Channon. When his football career finished he looked out his spikes again and once more is blazing his way to the finishing line.